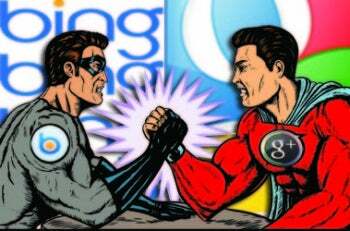 The battle between Bing and Google is getting personal, with both search engines fighting to become more socially connected. Microsoft recently added social features to Bing in response to Google's January rollout of Search Plus Your World (SPYW). Both forays into social integration try to bring your friends and connections into your searches to help uncover references you might not find otherwise. But Bing and Google are taking different routes to incorporate social features into search. Google is going heavy on Google+ and blending social content right into its results, while Bing says it wants to keep search results "pure" and cordon off its Facebook-focused social features to the sidebar. PCWorld's comprehensive review of Bing's social additions is coming soon, but until then here's a feature showdown between Google's SPYW and Bing's social features (BSF). Google's SPYW results are broken down into three columns. On the far left, you have Google's navigation column for modifying search results into as image searches, news searches, and time-specific searches such as data from the past month or year. Google's center column features its regular search results along with links and other data pulled from your own posts and your circles on Google+. To the right of Google's main search results is a space to show Google+ content, such as product pages, popular videos, images, or public posts related to your search. The new BSF features a main column of results, and to its left is space for a column called the snapshot. Snapshot pops out from links in the main search results and surfaces actionable information such as hotel rates, maps, online reservation tools, and restaurant reviews. To the far right is Bing's new sidebar, which shows relevant social information including posts from Facebook friends, experts from around the Web, and your friends' activity on Bing. Google search with social content. Bing says its new social integration will not affect its search results. "Instead of cluttering your results with social updates, we're honoring the purity of the core web results," Microsoft says in a blog post announcing the social overhaul. Google, on the other hand, has not been shy about significantly changing what shows up in its main search results. Take, for example, a search for the HBO show Game of Thrones. My personalized search results included items you'd expect such as links to the official series site and Wikipedia. 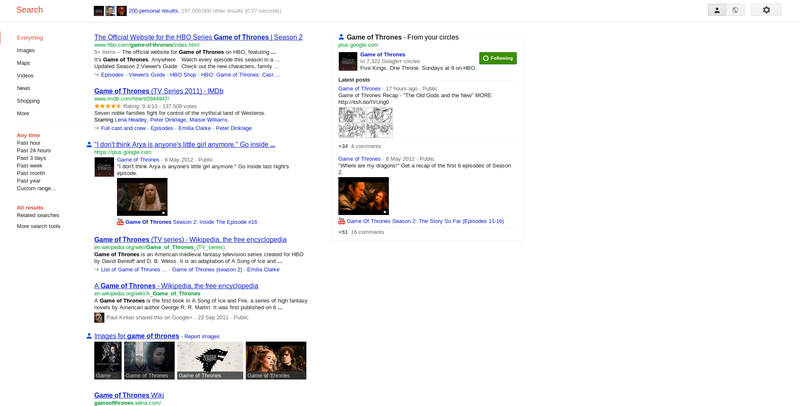 But I also got images related to Game of Thrones that have been shared on Google+, posts from connections on Google's social network, and relevant links that were shared by my Google+ connections. If I turn off the social features function by clicking the globe icon in the upper right corner of the page, I get Google's pre-SPYW results with no Google+ data included. You can also turn off Google's social search permanently in your search preferences. So both search engines are offering results unsullied by social networking data, but Google no longer offers this by default (if you are on Google+), while Bing does. UPDATE: It appears Microsoft's claim that Bing is "honoring the purity of the core web results" and putting social results off to the right sidebar may not be all it's cracked up to be. Search Engine Land reports that when you're signed in to Bing the main search results still include a few links based on your Facebook likes and items trending on Twitter. 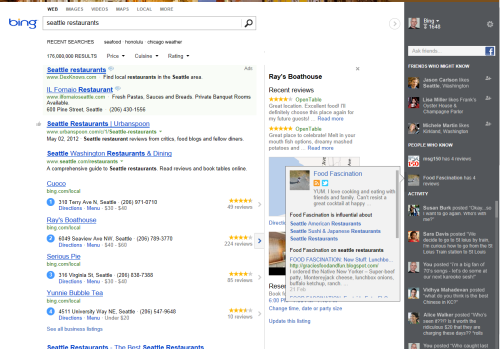 Bing first introduced social features to search in 2010. Bing's Snapshot column doesn't really have an equivalent feature on Google. Sometimes Google shows links to a map to the right of your main search results, and you can click a pop-out arrow for most links to a see a site preview. But that's not quite the same thing as collecting actionable data into one spot. The new Bing is in limited release, but from what I've seen, snapshot is something you are more likely to get when searching for commercial information such as flight, restaurant, and hotel reservations. Bing also doesn't appear to be doing anything too new with its snapshot column, it's just a better organizational tool than was available before. Microsoft offers an example of a search for "Drake Hotel Chicago" with snapshot information such as a hotel rate-finding tool, a list of sites with reviews, and images related to the search. If you do that same search on the current version of Bing, you get the same rate finding tool, along with links to related photos. And if you click on a link to "Bing Travel" you get the map, and links to user reviews. So snapshot appears to be more of an reorganization of information you can already find on Bing. To get similarly "actionable" information on Google you have to visit place pages on Google Maps. Both search engines offer an extra column to the right, filled with social information. Google's is strictly a Google+ only zone drawing material from such sources as pages related to your search, public posts from users, and popular videos related to your search on Google+. In my experience, however, Google shows this column only if you are following a person or page with relevant data. So if you search for Marvel Comics you will get a link to Marvel's Google+ page only if you are already following it. Bing's social sidebar includes information from your friends on Facebook right at the top of the sidebar under a section called "Friends Who Might Know." This section is populated with Facebook friends based on their likes, profile information, and shared photos. The idea is that you could then post a question or comment to a friend's Timeline right from the Bing sidebar and get relevant information from your friends. Under "People Who Know," Bing surfaces posts from people who are knowledgeable about your query on Facebook, but also draws from Blogger, Foursquare, Google+, LinkedIn, and Twitter. This is followed by "Activity Feed," which shows what your friends are doing on Bing, including questions they've asked and searches they've shared. Bing's sidebar is an interesting idea, but, similar to the snapshot feature, social integration is likely to be most helpful when you're searching for commercial information such as hotel or restaurant recommendations, or finding opinions about cars, new gadgets, and movies. Nevertheless, Bing is taking an interesting approach to social integration that feels very different from what Google is doing. The real test for Bing is whether users will find its new features engaging enough to give up on Google for good.